Garmisch-Partenkirchen is located on the German-Austrian border at the foot of the Alps. Already a popular German ski resort area, the growing city became a U.S. military garrison in 1945. Since then it's evolved into the US Army Garrison Garmisch and currently shares the kaserne with the Bundeswehr's Gebirgsmusikkorps of the First Mountain Division. 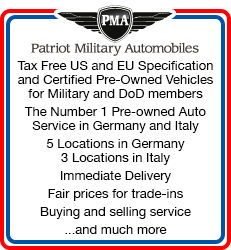 The population of Garmisch-Partenkirchen is approximately 26,000, and the close-knit military community consists of service members and DoD civilian employees assigned to the garrison or a tenant unit, family members and a large retiree population in Bavaria and Austria. Garmisch-Partenkirchen has many beautiful places to visit, beginning with the Zugspitze, the tallest peak in Germany with year-round cog-train service going deep through the mountain to the top, and cable car service to the summit. The 1936 Olympic Ice Stadium and ski jump offer local and international competitions. World-class winter sporting events are held on the Hausberg, with German and American ski lodges in town at the base of mountain. Just minutes away is King Ludwig II's castle at Neuschwanstein, the model for Walt Disney's Sleeping Beauty castle. Munich to the north is the wonderful capital city of Bavaria with its cultural activities, beer halls, the Nymphenburg Palace, the English Gardens and of course, Oktoberfest, the world's biggest party. USAG Garmisch supports three main tenant units: the George C. Marshall European Center for Security Studies at Sheridan Kaserne, the NATO School in nearby Oberammergau, and the Armed Forces Recreation Center. 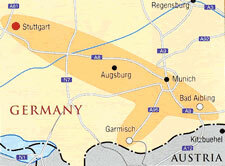 The garrison also supports numerous smaller units and facilities spread across Southern Bavaria. Military personnel from all branches of service live in the newly remodeled Breitenau Housing Area on Artillery Kaserne. The George C. Marshall European Center for Security Studies, located on Sheridan Kaserne in Garmisch, is a unique U.S. Department of Defense and German Ministry of Defense security and defense studies institute. Since its dedication in 1993, its mission has been to create a more stable security environment by advancing democratic institutions and relationships, especially in the field of defense; promoting active, peaceful security cooperation, and enhancing enduring partnerships among the nations of Europe, Eurasia, North America and beyond. With an international faculty and staff from 10 partner nations, the Center offers five graduate-level resident courses, outreach events such as conferences, seminars and workshops, a research program, foreign area studies and foreign language training. Since the Center's founding, more than 6,100 military and civilian leaders from more than 100 nations have graduated from resident courses and about 18,500 have attended more than 360 outreach events. The NATO School, located in Oberammergau about 12 miles to the northwest, is NATO's key training facility on the operational level. Since 1953, the NATO School has trained and educated members of the Alliance as well as personnel from partner nations. The mission of the NATO School is to conduct courses, training and seminars in support of NATO's current and developing strategy and policy. For more information check the USAG Garmisch website at www.garmisch.army.mil. Normal medical and dental care is provided by the German Army at Mittenwald. The TRICARE health benefits advisor assists with emergencies and is a liaison for patients using host nation health care facilities. Medical teams periodically visit to provide immunizations, optometry or veterinarian services. The Garmisch American School on Artillery Kaserne teaches students K-8. High school students may attend the Munich International School two hours north, but enrollment is limited and must be coordinated early. The Garmisch Community Chapel offers services and religious education in numerous denominations. The chapel staff can provide information about them. There is a wide range of religious study groups, classes and retreats offered. The Garmisch FMWR is an award-winning innovator when it comes to providing affordable services and family activities for the Garmisch community and guests. Army Community Service offers a comprehensive array of programs and services dedicated to maintaining the readiness of Soldiers, Sister Service Members, DA Civilians, Retirees, their Families and communities by fostering self-reliance, resiliency and stability. 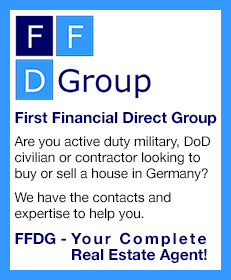 Mission areas include: money matters, home and family life, making a move, work and careers, learning for life, military lifestyle basics, managing deployment and separations and getting involved in your community. Additionally, the ACS Center converts into an Emergency Family Assistance Center in times of natural or man-made disasters, becoming the focal point of the community for information and support during a crisis. The Garmisch Child, Youth & School Services team provides exceptional child care, recreation and sports programs to children and youth of all ages. In partnership with command, families, schools and community members, it strives to exceed expectations in supporting children and youth's social, emotional, intellectual and physical development while instilling positive life-long skills. The Auto Skills Center at Artillery Kaserne offers assistance in performing automotive maintenance and repair. Equipment, tools, lifts, tire-changing equipment and an experienced mechanic help out with everything from charging a battery to major overhauls to save money. Mueller Fitness Center on Sheridan Kaserne has a well-trained staff, convenient hours of operation, large locker rooms, saunas, whirlpools, state-of-the-art fitness equipment, old-school weights, indoor basketball and racquetball courts, and they offer many assorted classes. The Crafts Tree offers various craft activities and classes, a ceramic shop, a wood craft shop, and a portrait studio with picture matting and framing. The Pete Burke Center, winner of the 2008 Best Small Garrison Facility award, is the place for many Garmisch community activities. The compact facility has a ballroom and a professional kitchen that can be booked for special events. On the center's first floor Outdoor Recreation Center offers skiing, snowboarding, camping and mountain bike rentals, plus classes, programs and periodic sporting events like kayak and mountaineering. Leisure Tours has guided adventures to destinations around Europe and the local area, with an experienced staff of knowledgeable guides. Upstairs, the Garmisch Library offers puppet shows and story time for the little ones, free internet access, DVD and video loans, and periodic local art and photography exhibits. The Garmisch Library has won the Best Small Garrison Library for five year in a row! Duffers can play the same greens that challenged Gen. Dwight D. Eisenhower at the garrison's Alpental Golf Course, a par-72 course. The facility offers a pro shop, practice areas, lessons and a restaurant serving lunch. The Garmisch Community Theater will be closed for renovation during the first half of 2009 and will have a grand reopening program later in the year. The Army and Air Force Exchange Service PX is located on Artillery Kaserne. Facilities include the main PX with uniform sales, clothing, shoes, household goods, electronics and sporting goods. Attached to the PX is the AAFES shoppette with basic needs and DVD rentals. The PX Annex has a barber/beauty shop, VAT office, antique store, thrift store, Bavarian gift shop, and a dry cleaners/tailor shop. Also in the center are the AAFES new car sales and Subway. The gas station is located nearby and offers tires, auto needs, cold drinks, and snacks. The Defense Commissary Agency has a small yet well-stocked grocery store serving customers across Southern Bavaria. The store, an award winner for customer service, recently had a total makeover and expanded its selection of American and European foods, and if they don't stock something but a bigger commissary does, they'll order it. The Army Post Office offers USPS services while the Community Mail Room has mailboxes for assigned personnel and local retirees. Banks. The Community Bank and Service Credit Union located in the PX center provide personalized service with convenient hours and ATMs. Lodging. The Armed Forces Recreation Center Edelweiss Lodge and Resort on Sheridan Kaserne is a modern hotel and seasonal campground for military, DoD personnel, and retirees. Employees are housed at the nearby Abrams Housing Complex.